I had seen this weather feature a few times in the settings section of Google Calendar, but I had never bothered enabling it, until today, and I wish I had done it earlier, it works great. Here is how you enable it for your Google Calendar. 1.) 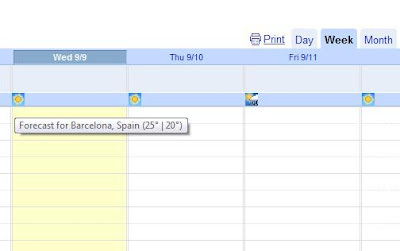 Click on the Google Calendar Setting button. 2.) Scroll down to the "Show weather based on my location" section and select "C" or "F" depending on what type of temperature system you use. Make sure you enter your location in the "location" section above the "Weather" section. 3.) Click the "Save" button located at the bottom of the Settings page and your done. Your calendar will now display the weather. she's going to share a proven way to start an web business.